I've moved around quite a bit in the last four years, squatting in places like El Salvador, London, Manhattan and eventually Syracuse. No matter where I go, I crave food from my hometown, Buffalo, N.Y. Even though I now live only two hours from Buffalo, I still can't get standard Buffalo cuisine. Exhibit A: SPONGE CANDY!This chocolate-covered crunchy toffee candy with a sponge-like appearance can only be made in certain climates. 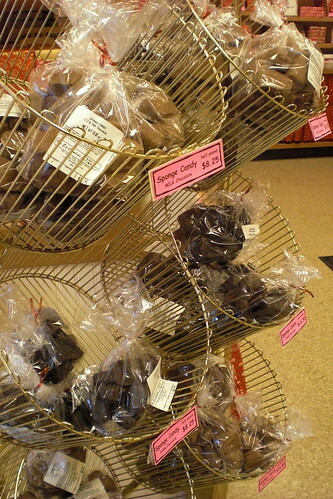 You might find variations of sponge candy in some parts of the world, but it always has a different name and a slightly different list of ingredients (see the Wikipedia article for more info). 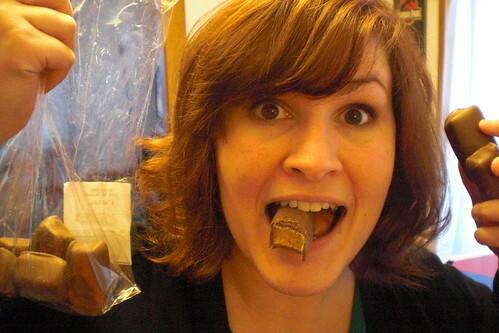 I eat Buffalo sponge candy exclusively. During my last trip home, I bought a half pound of the chocolate-dipped confectionery oddity and hoovered nearly every piece. 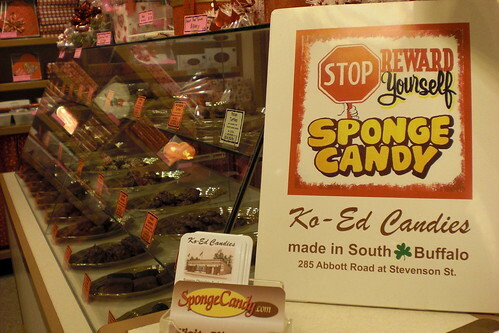 Want to try some legit sponge candy? I suggest having it shipped to you directly from Ko-ed Candies' site. Check out her take on Buddhism and Tiger Woods' karma on Religionisms. This is one lady to look out for! Wait a minute..by definition Buffalo Sponge Candy is THE sponge candy. You're preaching to the choir with this post, however - there still may be a few sponge candy "virgins" left in North America. If so, they certainly don't live in Western New York. The land of long winters and short summers AND plenty of sponge candy. Ko-Ed is nice but they tend to have a short selling season - have you seen this site? It seems new - but they seem to have a good handle on what makes Buffalo the sponge candy capital of the world...uh - would you believe the Sponge Candy capital of just North America> Thought so!